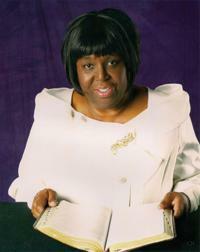 Pastor Judy W. Sykes is the pastor of House of Prayer Apostolic Faith Church of God, Inc. in Fort Myers, Florida. The daughter of Deacon Booker T. Davis and our late Founder and Pastor Dr. Ella M. Davis, she is the third of five children born to the union. She was married for 32 years to the late Minister Vincent Sykes, with whom she had two children, Donald and Shalisa Sykes. At age 10, Pastor Sykes was baptized in Jesus' Name and received the Holy Ghost. In 1952, Pastor Sykes attended Indiana Pentecostal Church in Chicago, Illinois, under pastorate of the late Elder O.D. Atkins. In 1960, the late Pastor Dr. Ella M. Davis founded and established the first House of Prayer Apostolic Faith Church of God in Hopkins Park, Illinois, where Pastor Sykes started her pillar ground and truth experience. She served as a faithful Sunday school teacher, missionary, prayer band leader, choir member, finance officer, and various other jobs. God continued to add to House of Prayer and the church relocated to 1500 East Willow Street in Kankakee, Illinois. Pastor Sykes and husband continued to serve in the capacities of armor bearers and strong pillars in the church. Through vision and spiritual confirmation Pastor Davis continued to do evangelistic services throughout the United States. In 1978, Dr. Ella M. Davis established House of Prayer # 4 in Fort Myers, Florida. In December 18, 1980, Pastor Judy Sykes heard the call from God and confirmation from her pastor to leave Kankakee and move to Fort Myers to oversee the work in Florida. Pastor Sykes graduated from Governor State University, where she earned a Bachelor's degree in Social Work and Human Justice. She worked 24 years for Child Care Southwest Florida. In 2000, she received her ministerial degree from Aenon Bible College. She received evangelistic training from Evangelical Training Association, Wheaton, Illinois. Presently, she continues to train to perfect her ministries. After the "homegoing" of the late Pastor Dr. Ella M. Davis, in September 2008, Pastor Sykes had been operating in the interim pastoral office. She has embraced the community by establishing several community outreach programs. "Concern Group for Others" (C.G.O) includes a food bank, sponsors the SHARE program, holds educational services for the welfare of people, and conduct services at several nursing homes in the Fort Myers community. On September 26, 2009, at First Baptist Church, 1735 Jackson Street in Fort Myers, Florida, Pastor Judy W. Sykes was installed as Senior Pastor of the House of Prayer Apostolic Faith Church of God. We ask that you pray for Pastor Sykes, that God will continue to give her the vision, for we all know "without a vision the people will perish" and if God gives a vision "he will make the provision." House of Prayer Apostolic Faith Church of God, Inc.